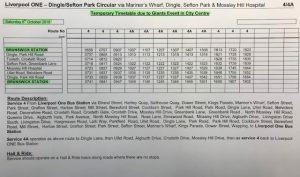 Due to the giants Spectacular event in Liverpool City Centre on Friday 5th October & Saturday 6th October, service 4 will be operating to a revised route and timetable. 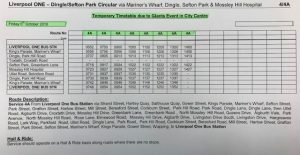 Friday 5th October: All journeys will operate as a 4A and omit Belvedere Road, Devonshire Road & Croxteth Road. The final journey of the day will depart Liverpool One at 14:00 and terminate at Mossley Hill Hospital at 14:27. Saturday 6th October: All journeys will start and finish at Brunswick Train Station, omitting Sefton Street, Mariners Wharf, Albert Dock and Liverpool One.